A robotic Air Force space plane that has spent more than a year in orbit on a mystery mission is slated to come back down to Earth this weekend, perhaps by Saturday, Air Force officials say. The Air Force is aiming to land its secret X-37B space plane, which has spent 15 months in space, on Saturday (June 16) at California's Vandenberg Air Force Base. But that timeline is dependent on the weather and other considerations, officials said. "We continue to monitor weather and technical conditions day by day to ensure conditions are safe for landing," Vandenberg spokesman Jeremy Eggers told SPACE.com via email. "At this time, the next available opportunity is Saturday, dependent upon weather and technical conditions. The landing window extends through June 18." The landing window for the X-37B opened on Monday (June 11). A solar array packed in the payload bay powers the spacecraft, giving it the ability to stay aloft for extended periods. 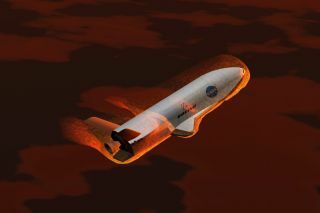 The Boeing-built X-37B is designed to land itself on a runway without the aid of a human controller. Another X-37B, called OTV-1, made the program's maiden flight back in April 2010. That vehicle stayed aloft for 225 days, well under the spacecraft's supposed 270-day limit. OTV-2 is already about 200 days above that limit. Just what OTV-2 has been doing for so long in orbit remains a mystery, because the space plane's mission and payloads are classified. Some nations — notably China — have voiced concerns that the X-37B may be a space weapon of some sort. Air Force officials, however, have consistently tamped down those suspicions, saying that the vehicle's chief task is testing out new technologies for future satellites. After OTV-2 lands, the skies likely won't be free of X-37Bs for long. The Air Force has said it plans to launch OTV-1 on another mission soon, possibly as early as this fall.